Transport secretary Chris Grayling has insisted ministers remain committed to building Phase 2 of HS2 but campaigners have accused him of writing a blank cheque. Mr Grayling was responding to an open letter from business leaders in the Midlands and North, calling on the UK’s four largest political parties to publicly commit to building the high speed rail link ‘in its entirety’ - including Phase 2, which heads north past Birmingham to Manchester and Leeds. 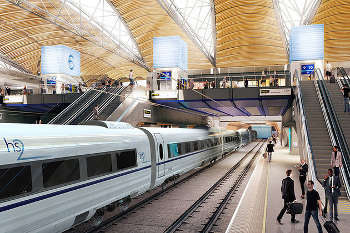 The Stop HS2 campaign group said the event had been organised ‘so that Government could seemingly lobby itself’ and criticised Mr Grayling for pre-empting the outcome of a business case review of HS2.